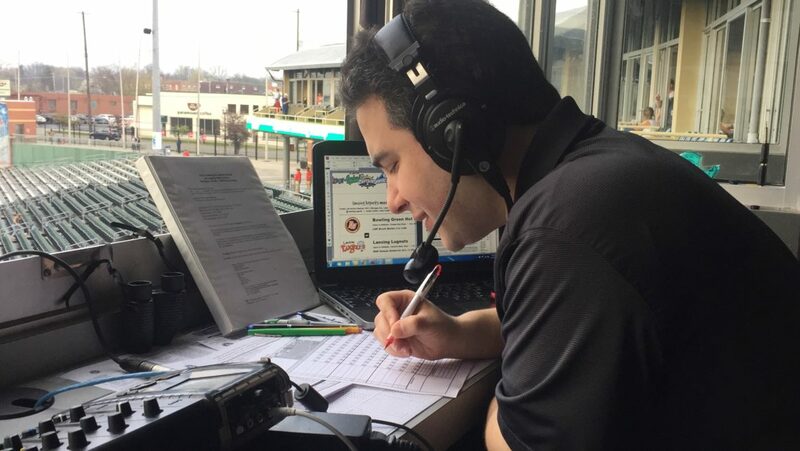 Lansing Lugnuts play-by-play announcer Jesse Goldberg-Strassler comments on a game in the broadcasting booth of Cooley Law School Stadium. As the lead broadcaster for Lansing Lugnuts minor league baseball team and Central Michigan University women’s basketball, Jesse Goldberg-Strassler often is the connection between sports fans and the teams they love. His job is bring those fans to the game, even if they’re listening from their couch. In the process, Goldberg-Strassler have to walk a line between being a representative of the fans and maintaining a relationship with the team. Spartan Newsroom: Have you ever faced an ethical dilemma in your career? If so, what is that? Jesse Goldberg-Strassler: Currently, I am the women’s basketball broadcaster at Central Michigan University, working with a group of students. I was watching a shootaround with one of those broadcast students, listening to the coach harangue the players. After practice, she called them together and told them in no uncertain terms that they needed to get themselves together. I told the student broadcaster at my side that whatever he saw did not exist unless it was cleared with the head coach. We discussed his pregame interview with the coach, which included a question about one of the things he had heard at shootaround. I told him that in order to ask the question, he had to ask the coach before the interview if this was something that was alright to be discussed. However, he forgot to ask her beforehand, brought it up during the interview, and had her refuse to answer the question. Thus he learned the lesson that I had learned a decade ago. SN: What were the choices available to resolve the dilemma and how did you weigh the pros and cons of your choices? Goldberg-Strassler: I mean you could move forward and share the information without clearing it with the source, or ask the source for permission to openly share the information. Of course, it’s quick and it’s easy if you’re moving forward without asking. However, you can seriously burn yourself and cause people in the industry to not trust you. It’s the professional thing to share after you got the permission. To ask for permission takes confidence and self-assuredness – and I would argue that it also takes integrity. SN: Are there any codes of ethics in place in terms of broadcasting for Lansing Lugnuts? Goldberg-Strassler: The broadcaster should be as low-drama as possible. That means having zero personality conflicts with coaches and players. The broadcaster should have a professional working relationship with everyone, and shouldn’t do anything to jeopardize it. SN: What are your strategies that you would like to share with future broadcasters about making decisions between what to share and what not? Goldberg-Strassler: Always ask. Always be upfront with the players and coaches that you speak with, just to make doubly certain that it is all right for you to share information. This goes in life, too. I got in trouble twice with friends when I was younger for spreading things that I had heard, when it would have been much smarter to simply ask the person. I hope that I now know better. SN: There is always a gray area between maintaining the trust and obeying the journalistic code of ethics like uncovering scandals. How do you make that balance? Goldberg-Strassler: I speak from my observational senses. I don’t go by rumor. If I can stand by my words, with facts at my back, then I am ready to be confronted by an angry player or coach. Jerry Liu is a sports journalism student at Michigan State University. He has worked for Beijing Television Station, iQIYI Sports, and Zhangyu TV as a sports reporter and broadcaster. He was a high school tennis player and he loves anything about tennis. Hard work and determination can make one’s wildest dreams come true. Just ask Danny Gieselman, a senior pitcher at MSU.